Most people think performers have an innate sense of confidence, a natural sense of fearlessness. But, that is NOT TRUE! As performers, we spend a huge portion of our time working on our own inner goodness. And, no one has outlined the way to craft a performance better than Constantin Stanislavski. He believed actors needed to know how they behaved first before they could try to embody the life of the character they would be playing on stage. I couldn't agree more. 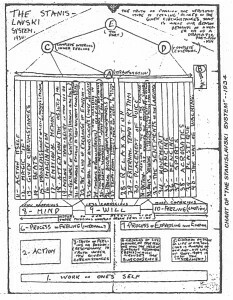 One of my favorite tools as a performance coach is his chart for The Stanislavski System. Check it out here. 5 THINGS THAT MAKE ME AN AWESOME PERSON. 5 THINGS THAT MAKE ME AN AWESOME PERFORMER. 3 THINGS I NEED TO WORK ON. Now, here's the thing, if you can't come up with the answers to these questions… how on earth are the casting directors/agents/clients/customers you encounter on a daily basis going to see all of the awesome you have to offer? You MUST know these things first so that you are able to sell your product. YOU! So, get out a pen! Make a list! We all have something that makes us awesome, even if it's just that you make a mean quesadilla! Find your quesadilla and get ready to share it with the rest of the world! Because, they are hungry for it! The world needs what makes you awesome, so put it out there! They are waiting. If you want to get deeper into this goodness… check out my new Performance Power program by clicking here!